Faxe Brewery is a Danish brewery located in the town of Faxe. The brewery was founded in 1901 by Nikoline and Conrad Nielsen and it is best known for its strong export beers. In 1989 Faxe Bryggeri merged with Bryggerigruppen which later developed into Royal Unibrew. 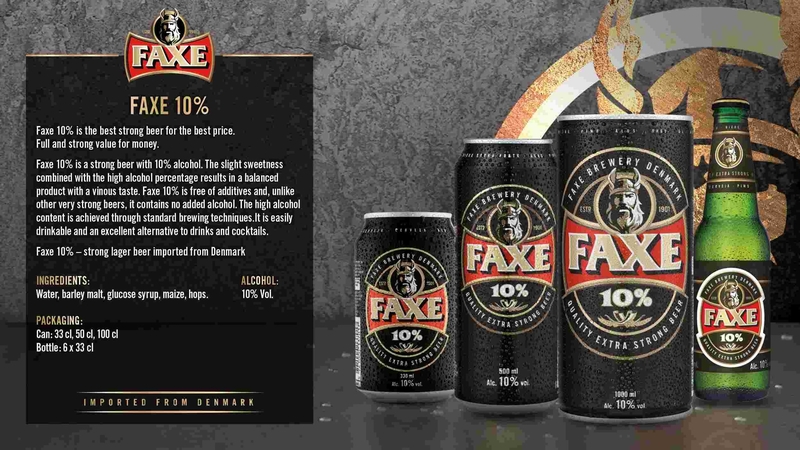 Starting in 1901 the Faxe Saga has been over a century-long voyage of discovery. In the course of this adventure we have skilfully blended our passion for quality with our ambition to create the very best in refreshing and flavourful beers and soft drinks. We have grown from a small family business with a vision into one of the most recognisable and trusted Danish brands, our logo becoming the embodiment of the Viking qualities of strength, reliability and honesty along the way.